Cleft Lip and Cleft palate are common birth defects affecting 1 in 1000 children born in the US every year. They are a result of an oral malformation occurring in the fetus in the early months of pregnancy. The incomplete oral formation occurs because of unavailability of enough tissue for the mouth area to develop. Lets take a look at what these malformations are and how they can be corrected with the cleft lip and cleft palate repair surgery. In case of a cleft lip, the upper lip of the child is normally split, and there is a gap in the skin between the two parts of the lip. The gap may be small or can extend as far as the nose. A cleft palate is an oral malformation where there is an opening on the roof of the mouth. It can be a gap in the soft palate or extend as far back as the hard palate. Though the underlying cause of the birth deformity is unknown, it has been attributed to environmental factors like exposure of the fetus to something harmful during pregnancy. It has also been observed that cleft lip and palate are genetic, meaning, it runs in the family. Children may be born with one of the deformities or both. The good part is that both these conditions are completely reversible, with the cleft lip and cleft palate repair surgery to restore normal functioning and appearance of the lips and mouth. Let us find out more about them in detail. 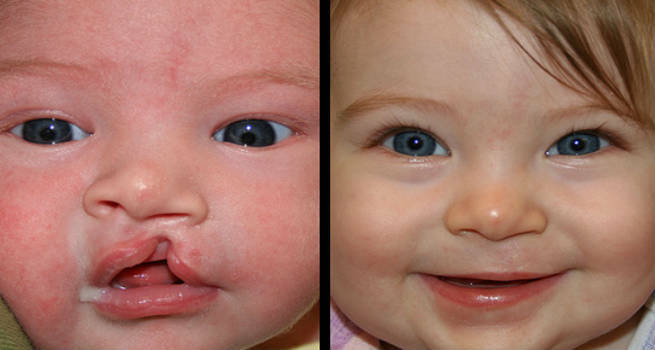 The cleft lip surgery is normally performed during infancy itself, when the child is a couple of months old. Since the condition affects the way the child can hear, eat and speak, you would need to consult multiple specialists before the surgery. A plastic surgeon will perform the surgery, with the help of a team of doctors that would include the child’s pediatrician, ear nose throat specialist, speech pathologist and a hearing counselor. The child is administered general anesthesia and the lip tissues are trimmed and sewn together so that the upper lip is more uniform. The sutures do not leave a very noticeable scar. The child is normally kept under observation in the hospital for a week following the surgery, to prevent any complications. Cleft palate surgery needs the child to be slightly older, say 9-12 months. The surgery involves repairing the soft or the hard palate, or both, depending on the condition. Sometimes, this one surgery is not sufficient and the child would need a palate reconstruction as he/she grows. Once the permanent teeth appear, the child would need braces and additional surgery to improve speech. This surgery is also done in the presence of all the specialists who are needed for the cleft lip surgery. While the surgery to repair a cleft lip is fairly straightforward, a cleft palate repair surgery could have some complications. There can be bleeding, clogging of water on the roof of the mouth and malformation of the bone in the middle of the face. As the child grows, he/she might need to see a dentist to fix any malformed teeth. Since cleft repair surgeries can cause hearing problems, it is necessary to regularly get the child’s hearing checked. The child might also need the support of a speech therapist to correct speech problems.